The country-touring truck made a stop in Walnut Creek last weekend, and it has several upcoming trips scheduled throughout the Bay Area. The Hello Kitty Cafe truck — a bright pink Mercedes van adorned with flowers and the feline Sanrio mascot — will be making several stops in the Bay Area in the next few weeks. Stoneridge Shopping Center in Pleasanton at 10 a.m. Saturday, Sept. 30. The truck will stay in each scheduled location until 8 p.m., or when supplies sell out. 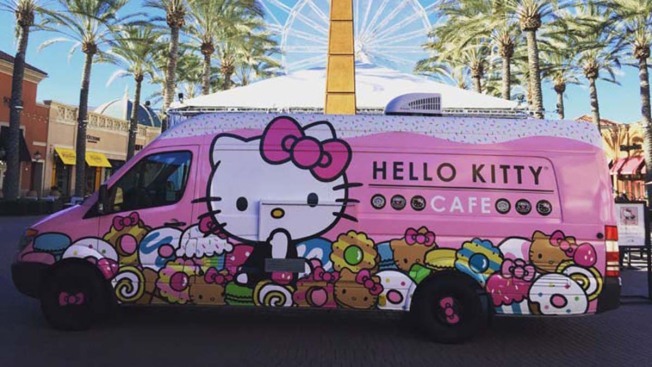 The Hello Kitty truck tours different cities selling — you guessed it — Hello Kitty gear and sweet treats, including T-shirts, coffee mugs and undoubtedly cloying macarons and doughnuts. Wherever it goes, a bounty of Instagram posts are sure to follow. Since making its debut at the annual Hello Kitty Con, a (surprisingly real) convention devoted to all things Hello Kitty, the truck and its retail items have attracted a rabid following on social media. In Walnut Creek last Saturday, more than 900 people turned out to get some of the coveted limited-edition goodies. Despite 90 degree weather, some people waited more than four hours to get to the top of the line. Watch the video above to see some highlights from the last event. Are you as excited as we are about #EatAnExtraDessertDay? �� �� ✨ Tag a sweet friend in the comments who you’d love to share dessert with!